Our video simulations are carefully shot to ensure that you will be fully immersed while practicing for your goal. Our products work on mobile devices, so you can practice wherever you would like to. When you use our software to prepare under actual conditions, you will be prepared for anything when it’s time for the real thing. We are proud to say that we have helped thousands of people meet their goals with our software. This 99-cent app will help you prepare for your job interview so you can land the career of your dreams. 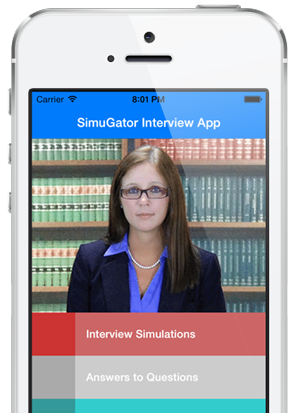 Three full-length interview simulations in video format. Over 50+ questions in total from different interviewers with different interviewing styles and demeanors. Ability to video record yourself answering each question using the front camera. Review and critique your answers. In-depth advice about how to answer each and every question. An index of all interview questions and answers tips for quick review. Thousands of students have used this LSAT test-day simulator to master timing, increase concentration, and decrease anxiety. It makes your LSAT PrepTests feel like the real thing. Makes strictly timing your LSAT PrepTests a piece of cake. With the push of a button, the virtual proctor tells you when to start, gives the five-minute warning, and tells you went to stop. Keeps you honest: if you give yourself extra time or take breaks during practice tests, you will not be ready for test day and your score will drop. By using this product to practice under actual conditions, you will succeed on test day. Turn Distractions Mode on to simulate the feeling of people being around you making common test-day distractions, which helps to improve your concentration and decrease your anxiety. A virtual proctor and test-day simulator for your SAT Practice Tests. Makes every practice test feel like the real thing, which helps you master timing, increase concentration, and decrease anxiety. "This SAT Proctor video makes it very easy to practice the test timed. And I think it makes a difference with my confidence when I use it, particularly after using it several times to time my practice tests. It just familiarizes you with what to expect on the day of test, and that's important. Because knowing what to expect is more than half the battle with the SAT I would say. If you take it enough times (enough practice tests I mean), you start to see patterns in the types of questions you will be asked that you would not recognize if you took it only one or two times or none at all. Since this gives you a simulation of the whole test, you get the best feel for how you will be feeling after 3 hours and what your best strategy will be for doing each question." "If you get nervous taking standardized tests, then pick this up. I did a few run-throughs with practice tests and felt better than my first SAT test. I'm taking it again, so this should help." "I took the SAT in June. I have to say that I studied intensely for about 6 months from winter break until right before the test. Practicing with old tests was the best method for retaining information for me personally, so I found this to be a key component of my practice exams. I took two tests before I got the Simugator DVD. I was not aware of how the exam was structured and how the timing would break down for each section. The DVD helped me to get a better feel for the exam and how the sections break down. It really helps you get a feel for the timing of the test. To me, this was the reason I thought the DVD made a difference. The distraction mode is cool, but being able to feel like you are in the exam room itself really helped me focus. 2200+ score, so I'm satisfied"
"Great product. Gives a real sense of how the test will go by with sounds and distractions. Very accurate when measuring the time given for each section, and also the 10 minute break. For any one who is preping for the LSAT, I really recommend this to put you in the test atmosphere so you can eliminate the fear of the test it self." "Great product, was extremely helpful for studying under accurate testing conditions. The distractions section was realistic and well executed. I would highly recommend this product to others." "I purchased this DVD about a year ago to help me better deal with all of the distractions that inevitably come with sitting in a room full of strangers for hours on end, in a room that is always either too hot or too cold. I have used this DVD 6 times while taking actual LSAT practice tests and it's been invaluable. I feel that even if the proctor calls time on a test section a couple of minutes early, I will still be ahead of the game because I have a very strong idea of just how much work I can do in 35 minutes, and just about how much time I can devote to each question type." "This is a very helpful tool in learning to pace yourself appropriately for the LSAT. The repetitive conditioning of performing under the time constraints for the specific test sections gives a very definite sense of confidence & preparedness. I really liked the variable option to include distractions. Well worth the cost!" "I took around 40 practice LSATs with the LSAT Proctor DVD and ended up getting a 180 on the actual test. 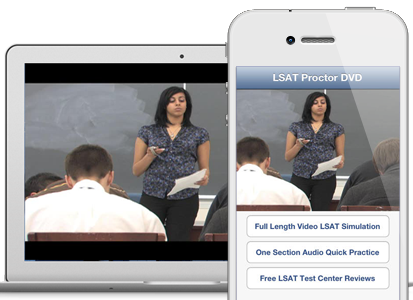 I found the DVD extremely helpful, well worth the cost, and I now recommend it to the students I tutor for the LSAT." "In the simplest of terms, this company sells a complete LSAT experience on a DVD." "This is probably the BEST investment I made for my LSAT studying. It's a proctor simulation that's exactly like the real thing. Just pop in the DVD every time you take a practice test and it will get you ready mentally for test day like no other tool will." "It was easy to underestimate just how much the testing conditions of the LSAT affect score; the quick succession of sections with little or no break wear you down, and the other students in the room shifting around and making noise pull away your focus. This is why so many students report a 10 point drop between practice tests and real conditions. The DVD made it possible to really know what real testing conditions would be like, and to practice being comfortable with them. Thanks for a much needed product."